My ex-wife and I used to be part of Dungeons and Dragons group and after gaming for a while, I decided to buy miniatures for everyone and paint them up to a basic degree. It was a fun diversion from my Hordebloods project and I managed to find miniatures that were a pretty close approximation of the actual characters themselves. 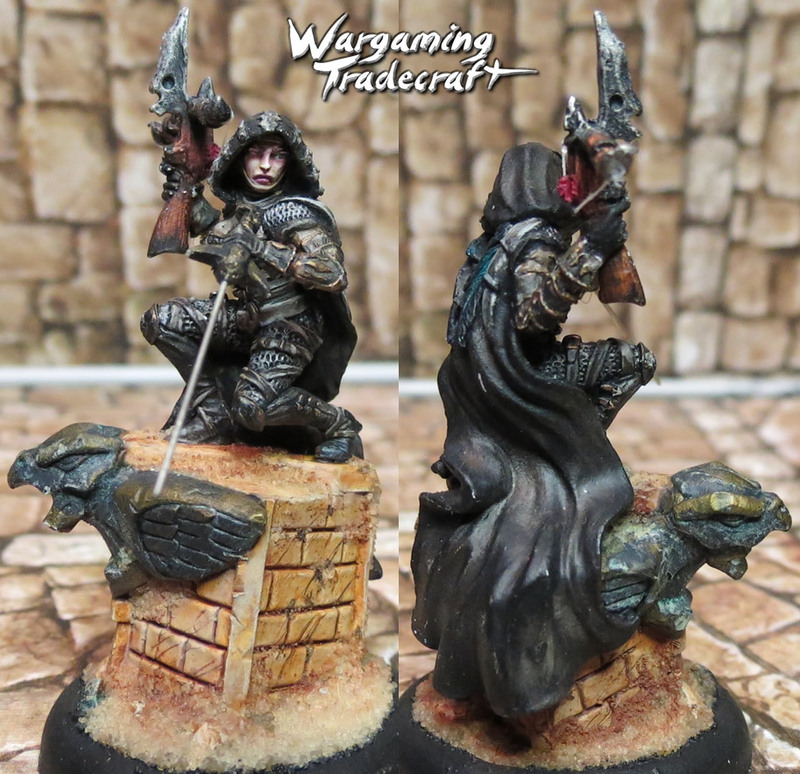 You've probably seen some of the posts already on the Adventurers from the Land of Olim, but this post will act as an index for the project, touching on the details of each figure with links to each walk through of how I painted most of them. This was my ex-wife's character, with some heavy modifications of a Scibor Miniatures dwarven female. The mace replaced her sword, the chain actually lets it swing, the backpack is fully custom sculpted and the shield has been sculpted to represent the hearth. Dwarves in this land are part of a caste system, the tattoo on her face a permanently reminder of where she came from. This was my character, part of the distrusted wizards who controlled magic in the realm. I've added a little gel magic effects and painted some object source lighting for the spell and actually completed him pretty quick by painting with washes. 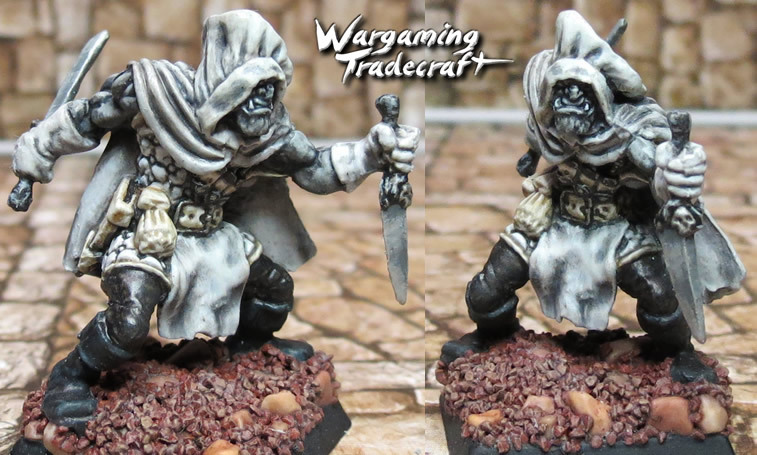 I'm glad I had another chance to play with black and white compositions and he was actually pretty fun to paint. Not much custom work aside from sculpting a floppy chef hat. I didn't take the time to write a tutorial for him, which was actually unfortunate because I'm incredibly happy with how he turned out. 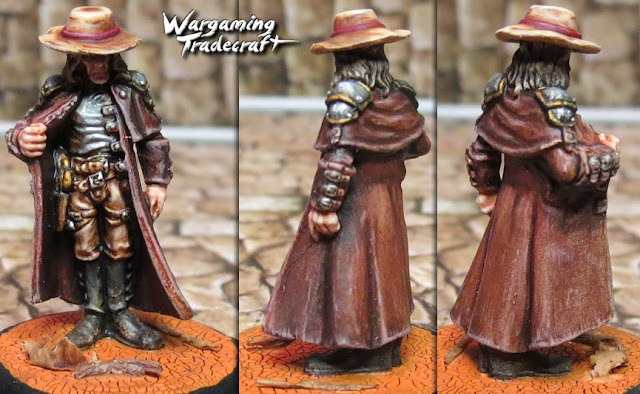 It's a model from one of Privateer Press' boardgames with a hat from a historical set. I painted a lot in layers before previous layers were done drying and the smooth plastic of the miniature lent to getting some nice blends on the leathers of this figure. Even the black boots were created using thickly washed and blended blacks and greys. His chest plate and shoulders are TMM to add a nice contrasting shine. I washed a little dark brown wash around the edges of the chest plate, especially in the shadow of his duster. For the base, it's just another example of how nice of a desert look that crackle medium can create. This is another I don't have much in the way of WIP photos for, but wanted to touch on some of the details that makes her unique. I've already written about bracing bows when I used string to make her crossbow more realistic. I cut off the sword, drilled a small hole in the hilt and super glued a guitar string in place. A little green stuff around the base of the string acted to help hold it firmly in place. Left: Painted gold, shortly after the chemical was applied. Right: after the chemical's had time to do its job. You'll notice in the final photo, the varnish dulled the blue some. I'm actually really pleased with how her face turned out. Essentially, standard skin tones, brown wash and skin tone highlight. The extra step was using some pink around her eyes and on her bottom lip.